How to reach cottage Suha? 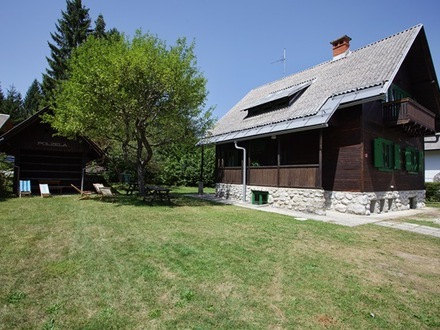 Larger groups and families, who would like to spend their holidays in the peaceful nature of the Triglav National Park, are all welcome at Cottage Suha Bohinj. We can accommodate 25 people in different types of rooms. The cottage is only 500 m from lake Bohinj. Cottage Suha was completely renovated in year 2013. Guest can use a brand new and completely equipped kitchen (dishwasher, glass-ceramics stove, refrigerator, kitchen ventilation, microwave ...) and a spacious dining room. In the modern kitchen you will find all necessary kitchen utensils, kitchenware and cutlery and also a wood burning iron stove. There are two similar, smaller wooden stoves in other rooms of the cottage – in the colder days they all make you stay at the Cottage Suha special. There are 3 bathrooms at the Cottage Suha (bath tub, 2x shower and 3x WC). Guests can also use a washing and drying machine and free WI-FI. We provide bed linen and 2 towels for all our guests at Cottage Suha. There is a big garden next to Cottage Suha (800 m²) which guests can use – there are also deckchairs available. There is also barbeque and 3 wooden outdoor tables for a pleasant outdoor experience. By the cottage, next to the garden, there is also parking available for our guests.